The word menisci are derived from the Greek work meniskos, which means "crescent". At knee joint the menisci plays a major role in congurency of the joint. Menisci forms the concavity in which the femoral condyles sits. Menisci rests between the thigh bone femur and the tibia and there are two knee joint ligaments. They are a type of cartilage in the joint. The rubbery texture of the menisci is due to their fibrocartilagenous structure. Their shape is maintained by the collagen within them. One meniscus is on the inner side of your knee--the medial meniscus. 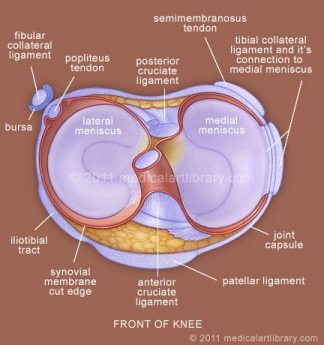 The other meniscus is on the outer side of your knee - the lateral meniscus. medial meniscus, and has a range of movement that may be as great as 10 mm (0.4 in) in an anteroposterior direction. 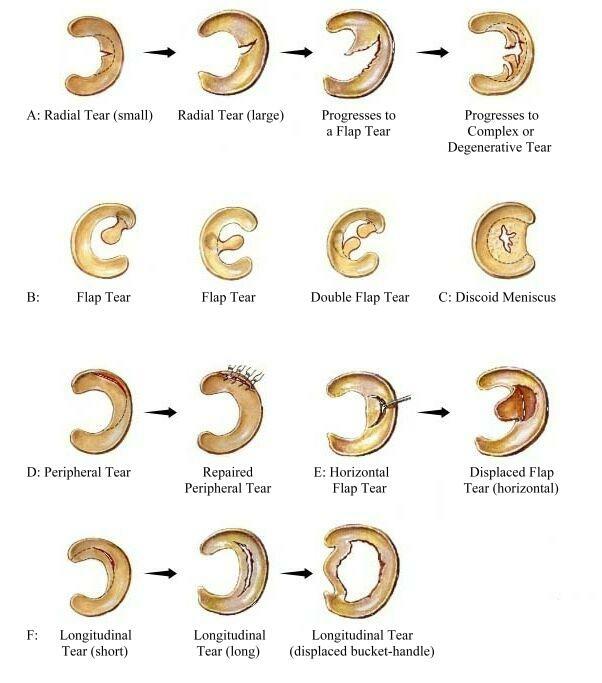 This mobility is explained by the close proximity of the attachments of the anterior and posterior horns and the lack of attachment to the capsular ligament posterolaterally. The firm attachment of the arcuate ligament to the lateral meniscus and the attachment of the popliteus muscle to both the arcuate ligament and meniscus ensure the dynamic retraction of the posterior segment of the meniscus during internal rotation of the tibia on the femur as the knee begins to flex from its fully extended position. The vascular supply of the menisci originates predominately from the inferior and superior lateral and medial genicular arteries. During the first year of life the meniscus contains blood vessels throughout its body but when the weight bearing starts the vascularity and the circulatory network diminish and only 25-33% area remain vascular by the capillaries of the capsule and synovial membrane. The vascularity diminishes so much that in 4th decade of life only the periphery is vascular whereas the center of the menisci is avascular. The center portion is completely dependent upon the synovial fluid diffusion for nutrition . The central avascular portion of menisci either does not heal completely or heal at all after injury. 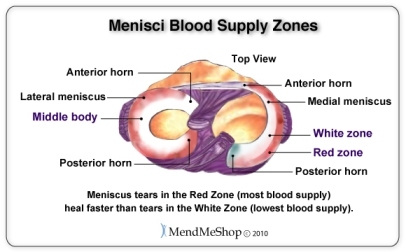 The horns of the menisci and the peripheral vascularized portion of the meniscal bodies are well innervated with free nerve endings (nociceptors) and three different mechanoreceptors (Ruffini corpuscles, pacinian corpuscles, and Golgi tendon organs). The most common mechanism of menisci injury is a twisting injury with the foot anchor on the ground, often by another player's body. A slow twisting force may also cause the tear.Damage to the meniscus is due to rotational forces directed to a flexed knee (as may occur with twisting sports) is the usual underlying mechanism of injury. The patient comes up with major complain of knee pain, swelling and knee locking which is when the patient is unable to straighten the leg fully. This can be accompanied by a clicking feeling. A valgus force i.e hyperflexion of the knee and also on internal rotation of the foot and the lower leg in relation to the femur when the knee joint is flexed to 70–90° cause the lateral meniscal tear. – weakened or hypotrophied quadriceps muscle. X-ray is done in weight-bearing but is not helpful in detecting the medial meniscal tear, but, can detect other associated conditions at bony level. Meniscal tear can be well appreciated on an MRI. ↑ 1.0 1.1 1.2 Gray JC: Neural and vascular anatomy of the menisci of the human knee. J Orthop Sports Phys Ther 29:23–30, 1999. ↑ McCarty EC, Marx RG, DeHaven KE: Meniscus repair: Considerations in treatment and update of clinical results. Clin Orthop 402:122–134, 2002. ↑ Zimny ML, Albright DJ, Dabezies E: Mechanoreceptors in the human medial meniscus. Acta Anat (Basel) 133:35–40, 1988. ↑ Mine T, Kimura M, Sakka A, et al. : Innervation of nociceptors in the menisci of the knee joint: An immunohistochemical study. Arch Orthop Trauma Surg 120:201–204, 2000. ↑ 5.0 5.1 Peterson,Renström. SPORTS INJURIES:Their Prevention and Treatment.Third Edition. ↑ 6.0 6.1 Brunker,Khan.Clinical Sports Medicine.3rd Edition.